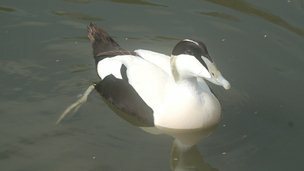 Chris Watson says people living or visiting the area often wrongly believe eiders are tame as they are "friendly". He told BBC Radio Four's Broadcasting House the sea birds may seem to enjoy the food but it damages their eggs. The Northumberland coast is recognised as a haven for wild birds, including colonies of eiders. Mr Watson, whose work as a nature sound recordist includes documentaries with Sir David Attenborough, said: "Normally eider ducks eat shellfish not fish and chips - [which is] lacking calcium so the eggs are failing. "There's a problem because they are such attractive, friendly birds to feed, and yet the food that we are giving them - bread and things like that - is actually causing a dietary problem." Good to educate well-intentioned people when they are doing more harm than good. Its so true Bruce..most people mean well when they feed any of the fowl..But it is so harmful to them.. This is sad, where I live, around 200 miles south of Northumberland, people are always feeding the ducks in the river running through our local town. The poor things eat so much bread, it simply cannot be good for them. Natasha has mentioned that where she lives it is illegal to feed ducks, it isn't here but I cannot help but think it would be a good idea. Thanks Dee for the link to the article. Why doesn't the local council pass an ordinance banning feeding the ducks? Read and noted. Its awfully harmful for them for so many reasons..
Its actuallycauses malnutrition..deformities.. effecting their beaks..feathers..wings..feet.. Causes overpopulation which sadly then leads to their demise.. It can even change their behavior..making them territorial and very aggressive amongst themselves and with humans..
And can even alter their migration patterns.. So while one may think they are helping them..I wish they would realize they are sadly causing them harm and stress.. It should be illegal..for their sake..
Noted- thak you for posting. Wasn't aware that people did this. Completely barmy. Thanks for the info.